If there’s one word that has popped up more in game reviews than any other over the last couple of decades, it’s surely the word ‘zombie’. The leagues of undead are a well established staple in videogames and, though they’re more commonplace a foe on console or PC, they’ve also started to make their presence known on mobile in recent years. In some cases, this is most definitely a good thing. Few people would criticise The Walking Dead for placing bloodthirsty brutes front and centre, though the way in which they’re deployed – acting as barriers to the narrative, pushing the plot along rather than being mere cannon fodder – undoubtedly makes play feel fresh and fierce rather than tired or trite. Even Zombies, Run!, which takes the threat of a zombie attack and turned it into a location-based running app, manages to put a different spin on a familiar formula. If only such compliments could be paid to A Few Days Left – an apocalyptic ‘thriller’ that falls back on such entrenched clichés that it barely sees the need to devote all too much time to explaining the plot. 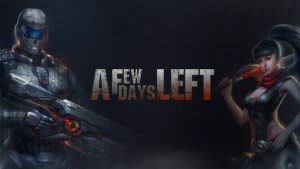 Despite its big billing – an opening cut scene depicting the mauling of a helpless woman lost and alone on the streets – there’s very little weight behind A Few Days Left when it comes to actual gameplay. You focus on the role of a suited up enforcer, patrolling level after level in order to take out anything that moves. A top down twin stick shooter, you move with the left stick and shoot with the right, with the addition of a melee button for close combat and various other special moves (hidden away in a somewhat cumbersome mini-menu) designed to keep things interesting. Ahead are scores and scores of mutants – standard zombies charging at you from all directions, giant spiders that emerge from the ground and surround you, and – early on – hideously amorphic beings that explode on contact in much the same manner as The Flood in the original Halo. In terms of the way said enemies are deployed – and, indeed, the manner in which you’re expected to take them on – A Few Days Left is unashamedly traditional; there’s nothing unscripted here, with enemies attacking in triggered groups. The difficulty level naturally ramps up the further you play, but everything contained within is entirely intentional, with new enemies introduced in a drip feed manner. Your mechanised man will fire straight ahead unless directed, and success becomes a case of attempting to keep your distance as your enemies roll over the top and head in your direction like the men of the Somme. However, so dry is A Few Days Left’s gunplay that it becomes much more fun to let enemies approach and then swipe them down with a melee attack, limbs flying out left, right and centre. It’s an riskier way to play, but if longevity is your aim, then it’s an entirely necessary one, because A Few Days Left does very little to shake up what is an uninspiring formula. Whether playing in one of the game’s in door stages or out in the open, the routine is a predictable one; move into walled off area, kill everything in sight, move through to next walled off area, kill everything in sight, repeat until you beat the boss. The one element of play A Few Days Left throws into the pot in an attempt to spice up its palette is the odd puzzle, where working out how to make your way through a section of a stage by hitting triggers in the right order to open up the path ahead is the order of the day. Though the action does ramp up when the levels get physical – giant Sonic the Hedgehog like blades and a huge ice ball that feels more than a little inspired by Indiana Jones – you’re nevertheless hit with the feeling that it’s a matter of time rather a question of skill: sooner of later you’ll figure out where you need to go and in what order, more by a process of illumination than any sense of initiative. And this is the sense A Few Days Left leaves you with. Without offering any kind of original take on a zombie apocalypse, the game quickly turns into a competent but utterly by-the-numbers shooter built around existing blueprints. Worth a purchase if you fancy a trip down memory lane, then, but one to skip if you’re looking for some rather fresher meat to chew on. The very definition of ‘average’, A Few Days Left attempts to use established zombie cliches to build a solid twin-stick shooter around, but instead Perfect World has served up a game that makes little attempt to make a name for itself. It’s be unfair to describe A Few Days Left as anything worse than adequate, but at the same time, there’s little here to write home about. The post A Few Days Left appeared first on Trusted Reviews.